I’m noticing some strange things about best in bags since yesterday. 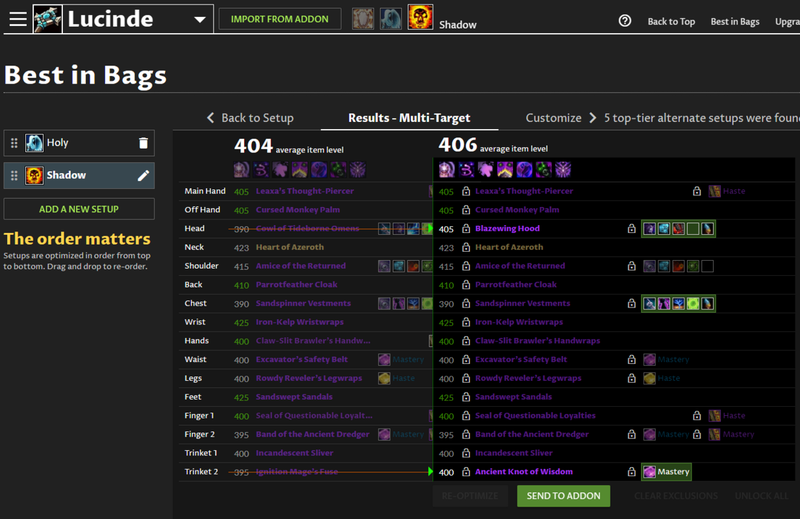 One particular case is the shadow priest spec recommendation selecting two mastery based trinkets (385, 400) over the Ignition Mage’s Fuse (395), but then identifying that gear better than mine has more haste. Even though shadow is my secondary spec, that shouldn’t impact the dps rating for the trinket’s value. Similarly in shadow spec, it’s treating my gloves with mast/vers (410) as better than haste/crit (400) despite the calculated stat values shown for pawn rating haste and crit relatively higher than mast/vers. A separate request I have is that instead of stacking traits with the customize azerite/stats option, there are a couple I would like to have “one of” or at least one of such as Word of Mending or Promise of Deliverance. As it stands today, I have to start with the recommendations from the Robot and then spend time reviewing gear pieces per slot to lock in pieces to achieve my desired traits. could you tell me what settings you are using? (talents, gearing strategy)? Even more customization on the “customize” feature is something we would like to put in. I agree it would be useful. I wonder if something with how you have the higher priority sets could be making something happen. If you want to give me all the settings for any sets above shadow in priority as well I could recreate your exact setup and see what’s up. I have Smartly Plumed Cap locked in for Holy M+, and Blazewing Hood locked in for Holy Raid. Your screenshot shows the problem though. Shadow spec should prefer the Ignition Mage’s Fuse or Crest of Paku over the Ancient Knot of Wisdom or Moon of Zin-Azshari if haste is preferred over mastery. The Band of the Ancient Dredger has been updated to use haste gem and enchant because of a new ring available. The belt is used in both specs, so mastery takes precendence. I used your settings and the new export string and now it recommends Sliver and Conch of Dark Whispers. As you can see, those trinkets are all really close together. The optimizer is definitely working here and finding you a top-tier set of gear for the gear in your bags. The difference between the Conch, Crest, and Fuse are within margin of error of each other. Especially with trinket procs… you can’t really think of it like: I need more haste so a haste proc trinket will always be best. If only it were that simple! Our optimizer smooths out the noise in the simulation data to give you solid, stable gear suggestions. If you prefer to use the fuse for the on-use, I’d recommend just locking it in. If used optimally, you won’t notice a difference between that and the default recommended items from BiB. Thanks, I’ve been using the Robot since late WoD and always appreciate the support figuring out what’s going on under the covers. I’ll just get things locked in per your recommendation.